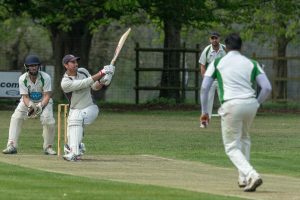 Guy Warman played a true captain’s innings to guide Knebworth Park to victory over Ickleford in their Division One match on Saturday. But Warman, pictured, settled any nerves with 21 not out off only 12 balls with perfectly executed strokeplay in a partnership with Matt Hutchinson (32 not out) that secured victory by seven wickets. Hutchinson’s equally fine innings included one massive six that embedded itself high up in the maple tree never to be retrieved. The Park’s chase for victory began dynamically as Mo Asif smashed 52 including six fours and two sixes in an opening stand of 55 with Tom Liversidge. Adam Sergeant carried on the the good work with 20. 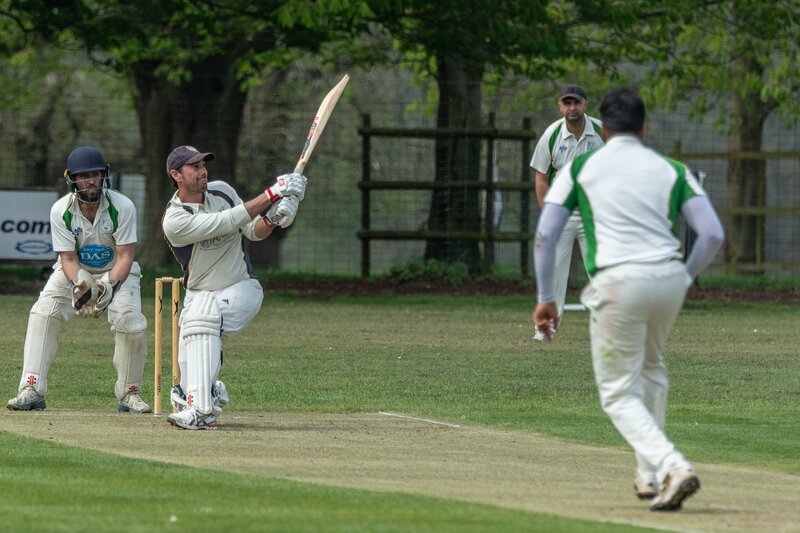 Briefly, the Park’s innings stuttered before Tariq Umair (53) and Charlie Randall (25) took them within sight of victory in a stand of 62 for the fifth wicket, both batting positively and sensibly to take a firm grasp of the match. In a game of fluctuating fortunes the balance soon swung Ickleford’s way as Randall feathered a catch to the keeper and Tariq miscued a shot to extra cover after completing an excellent half century. That left the stage for Warman and Hutchinson who took only four overs to hurry them home. Ickleford had begun the game well with a sound opening stand of 40 before Asif took a screamer of a catch in the slips off Sam McCrow to remove opener Jack Edwards for 26. That was one of a string of brilliant catches taken by the Park and included efforts by Randall and Sergeant. With Warman taking 3 for 33 and McCrow 2 for 33, Ickleford had slumped to 88 for 5. That all changed as the hard-hitting Dillon Smit (60) supported by Ben Mason (26) in a stand of 72 turned the game round, Smit forcing the normally frugal Hutchinson to be removed from the attack as he went for 28 in three overs. Ross Courtney replaced him and he, too, suffered similarly. It was Courtney, though, who then proved the hero with an acrobatic catch on the deep mid-wicket boundary where the ball was destined to go for six to remove Smit off Randall’s bowling. Randall ended up taking 3 for 42 as the visitors batting then lost momentum to finish with what proved a below-par score of on the batting-friendly surface. That left the stage for the Park’s innings which saw the culmination to an excellent match between two sides that last year were locked horns in the battle for promotion from the division below. The Seconds won for the third week running, beating Hatfield Hyde by five wickets to move to third in the table in Division 4a. A superb opening spell by under-15 all rounder Ollie O’Brien with 3 for 27 set them on their way and with Gareth Jones (2 for 8), Graham Fisher (2 for 20) and Alex Richmond (3 for 25) making the most of helpful bowling conditions and tricky pitch, the home side were shot out for only 86. The fielding was exemplary, with a diving effort by Lewis Hutchinson at mid-on and a leaping grab at first slip by Richmond proving the best of the catches. In reply, Richmond (21) dug in after the loss of a wicket from the first ball, before skipper Jono Evetts (23) smashed some meaty blows to take his side to the brink of victory. Although they lost wickets in the process and the task proved more testing than expected, the Seconds had more than enough in hand to cruise to victory. The Thirds were the only team to lose, despite a superb 5 for 32 from Ben Childs helping to bowl out Weston for 186. In reply Knebworth only managed 89 with Parag Kulkarni top scoring with 25. A career-best 71 not out from Phil Wheeler carved out a rare and convincing nine-wicket win for the Fourths over Cheshunt II. Wheeler was supported by John Inman (44 not out) in chasing down the visitor’s below-par 140-6 on what was an excellent batting surface. Earlier, a superb opening spell by Amelia Kemp restricted the home side. It was Phil’s brother, Richard, with his first bowl for two years who did most damage with 3 for 23. He was backed up by John Inman (2 for 22) and Jonathan Cirkel (1 for 17). Excellent catches by Kemp, Ian Murrill and Tommy Rowe plus a sterling wicket keeping display by Catherine Cirkel provided terrific support to help set up the win.